New York City is a notoriously tough market for restaurateurs, with ever-present competition for diner dollars and rising rents leading many to open stalls in food halls (where startup costs are significantly lower) or hop on the fast-casual train (which serve a steady stream of customers at a higher turnover rate). For higher-end dining concepts, from sit-down to multi-course fine dining, hotels offer a built-in customer base, and the restaurants in turn bring guests into the hotels. 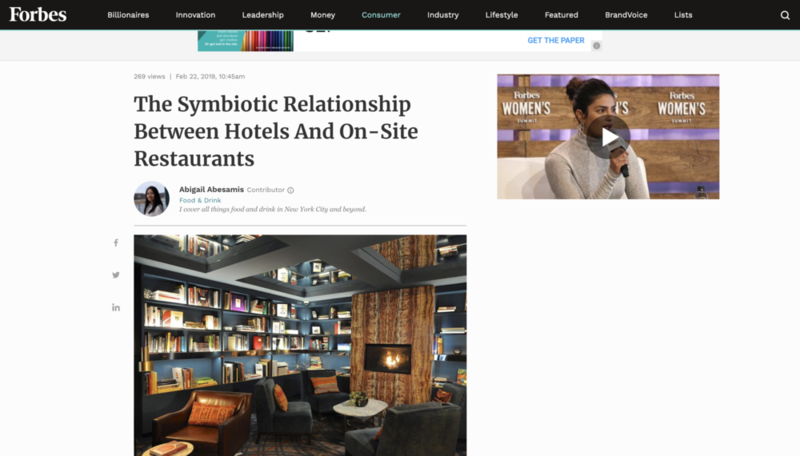 Below, I take a closer look at this symbiotic relationship between hotels and their on-site dining concepts, as demonstrated by the Park South Hotel and LUMA Hotel Times Square. The food and beverage program at Park South Hotel was shaped by Tim Cushman, a 30-year industry vet and James Beard Award-winning chef, and his wife Nancy Cushman, co-owner and founder of restaurant group Cushman Concepts. First came o ya, a high-end, contemporary Japanese restaurant that was first launched in Boston; then Covina, an all-day restaurant serving American fare; and finally the scenic Roof at Park South. Park South further entices hotel guests to dine on-site by offering a glass of wine or beer at Covina’s daily happy hour, ramen happy hour at o ya and exclusive views at the Roof. Nancy Cushman points out that Park South is still a boutique 130-room hotel, and while hotel guests offer a lift in business, outside guests drive most of its economic success, in addition to private events and catering. “It’s a self-feeding ecosystem that fulfills the needs of many different important business and leisure audiences,” said Cushman. Ortzi by chef Jose Garces is the anchor dining concept at LUMA Hotel Times Square, and there’s a more informal bar and café that leads into the restaurant. Michael Han, Ortzi’s chef de cuisine, listed the “built-in audience” as a key benefit to working in a hotel restaurant. “In addition to the hotel guests, we also attract local diners who are looking for a taste of Basque Country and want an oasis amidst the bustle of Times Square,” said Han.